Championship since July. Unfortunately, Paul Bird had to withdraw his entry on the week leading up to the rally due to his British Superbike Team commitments. On a better note, Brian Bell was entered alongside one of his old navigators in Welshman Paul Spooner. After more than a month out of the car due to no event in the BTRDA together with the engine on the his Ford Focus WRC being due for a rebuild, Brian decided it best to have a pre event test. The team had a new set-up for him to try on his Focus WRC so this test would also let him try it out. 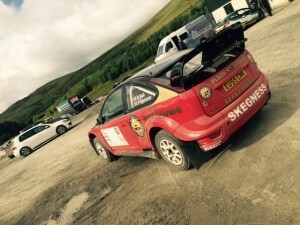 Although navigator, Paul Spooner, could not make the test due to work commitments Brian had a short but successful test at Sweet Lamb in Mid-Wales with the rebuilt engine feeling sharp and his confidence in the new set-up was where he wanted it to be. The team washed off the Bell Leisure backed car and gave it a thorough check over before heading to all the pre event checks by the organisers. On Saturday morning the weather was damp but the stages were still hard under the surface after a long dry spell on the lead up to the event. Bell started well with clean runs through the first 2 stages totalling 9 miles. Then came the two longest stages of the rally with a 10 miler and a 9 miler. With Spooner reading the notes like old times, they had good runs through Stage 3 and 4 but a small overshoot on both dropped them a little time and back to 22nd overall. 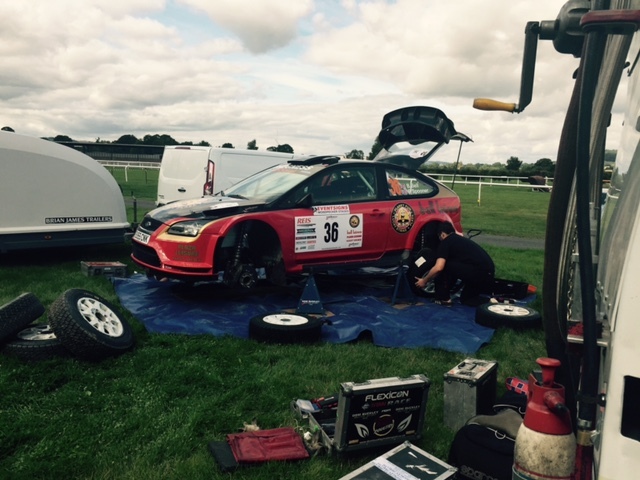 There was a 20 minute service before the last 2 stages for the Dom Buckley Motorsport team to check over the car which had no problems so far. A push on the those stages with no mistakes and no problems saw the pair jump up to 18th overall through the final control. Another enjoyable and clean rally for Mr Bell and he is now looking forward to the Trackrod rally at the end of the month.